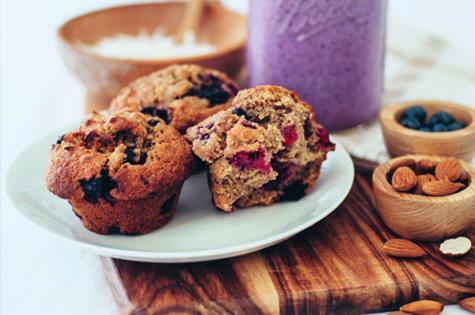 These Gluten Free Berry Nice Muffins are a sweet treat that everyone can enjoy. Packed full of juicy raspberries and blueberries, they’re a moist indulgence that’s perfect popped in a lunchbox or enjoyed with a hot drink. Made with Weet-Bix, this is a super healthy choice for breakfast! Sift flour, baking powder and cinnamon into a large bowl. Stir through sugar, crushed Gluten Free Weet-Bix biscuits and berries. Combine egg, So Good Regular and lite olive oil spread. Add liquid ingredients to dry ingredients, stirring gently until just combined. Bake in a moderately hot oven, 190?C, for 30 minutes. Start your mornings with Weet-Bix!